DUDES… THIS IS THE BEST HANDSDOWN PEDAL OF ITS KIND!! WOW! 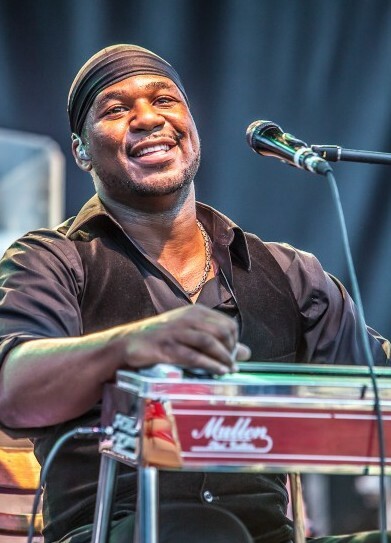 Frontman Robert Randolph was trained as a pedal steel guitarist in the House of God Church and makes prominent use of the instrument in the band’s music. The instrument is referred to in many African-American Pentecostal churches as Sacred Steel. Randolph was discovered while playing at a sacred steel convention in Florida. Before releasing albums with The Family Band, Randolph was selected by avant-garde jazz organist John Medeski to join him and the North Mississippi Allstars on their 2001 jam project, The Word. Just prior to the release of The Word’s debut album, Randolph was brought to the attention of music fans through an enthusiastic review by Neil Strauss in the New York Times in April 2001. On their first non-church tour of the East Coast, Randolph’s new Family Band band opened for the North Mississippi Allstars and then rejoined the musicians after their set, with Medeski, as The Word. The first Robert Randolph and the Family Band album, Live at the Wetlands, was released in 2002 on Family Band Records, recorded live on August 23, 2001, just prior to the club’s closing. The band released their studio debut, Unclassified on August 5, 2003. They attracted the attention of Eric Clapton, and have subsequently toured as a supporting act with the English blues guitarist. Clapton later guested on their 2006 album Colorblind, playing on a cover of “Jesus Is Just Alright”. In 2002, they were hired by ABC to make the network’s new NBA theme song. The song, “We Got Hoops”, only appeared in three telecasts, though it was used throughout both the NBA and WNBA seasons during promotions for both leagues. In September 2003 Randolph was listed as No. 97 on Rolling Stone’s 100 Greatest Guitarists of All Time list. Robert entered the list following Leigh Stephens and directly preceding Angus Young. In February 2004 Robert Randolph and the Family Band along with the band O.A.R. released a cover version of Led Zeppelin’s “Fool in the Rain”, which was subsequently placed for purchase online in the iTunes Music Store. This version was played live with O.A.R. at their August 15, 2009 show at Madison Square Garden.